Ah, Lent. The time of year when, on top of the normal “what should we have for dinner” daily conundrum, many people also have to consider what indulgence they’ve given up for 40 days, and what day of the week it is, and of course how many weeks in a row they can stomach eating fried fish. Seriously, every Lenten Friday you might notice that every restaurant reeks of oily seafood– especially up here by the shore. James (with his aversion to all ocean-dwelling things) tries to avoid eating out at all costs on Fridays during Lent because he can’t stand the smell. And even though I enjoy a basket of fish and chips as much as any other gal, it’s time we diversify this whole Friday meal plan thing. 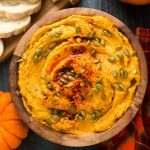 As my vegetarian pals out there know, the task of finding a meat-free dinner that’s delicious (and not deep-fried) isn’t nearly as hard as it seems initially– and the criteria doesn’t constrain you to a diet of only salads and tofu. There are meals out there that are so deeply packed with flavor that you won’t miss meat for a second. 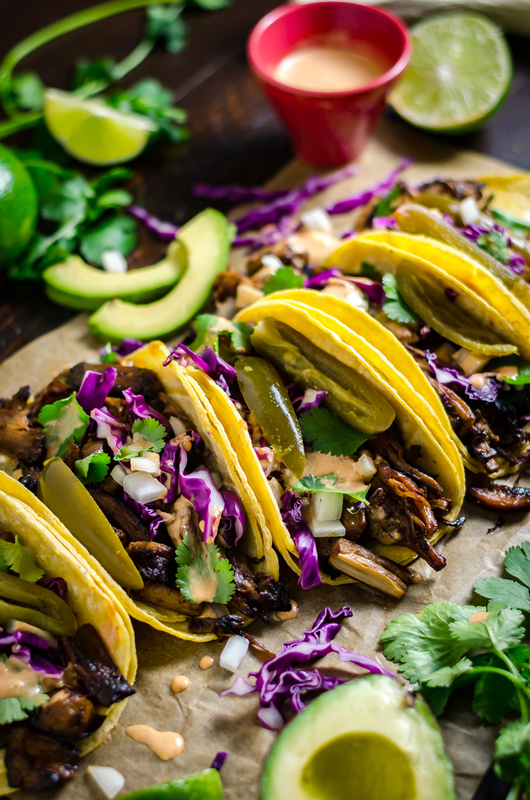 Take, for example, these Mushroom Carnitas Tacos. 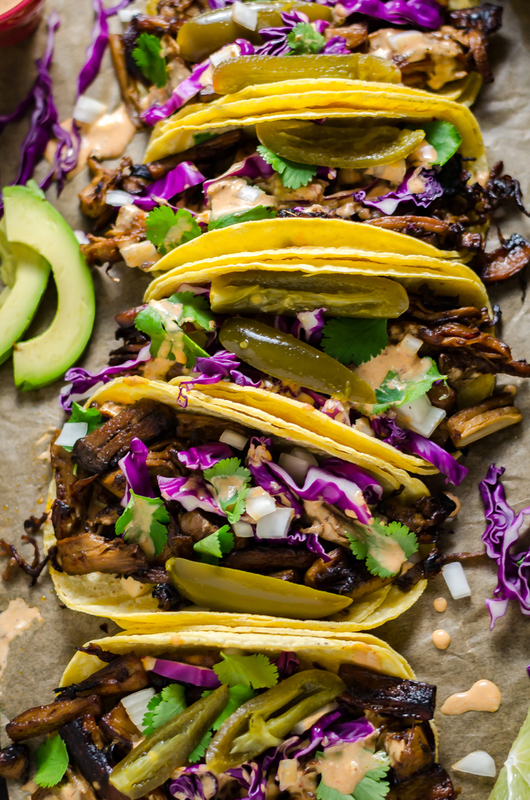 It looks a bit like pulled pork or chicken in there, but these tacos are actually made of king oyster mushrooms, which pull apart easily after being cooked in liquid. King oyster mushrooms are gigantic and honestly pretty strange-looking, but luckily they taste much, much better than they appear. They’re earthy but mild, and boast a denser, chewier texture than other mushrooms. 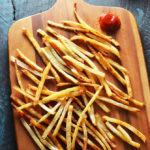 In fact, they’re often described as having an almost meaty texture. If there’s an Asian Market by you, you should be able to find them there, no problem. If there’s not, and if your local grocery store doesn’t carry king oyster mushrooms, feel free to substitute in portobellos or other easily-available ‘shrooms. They won’t pull apart the same way or have quite the same texture, but as long as you like mushrooms, you’re still going to love them. 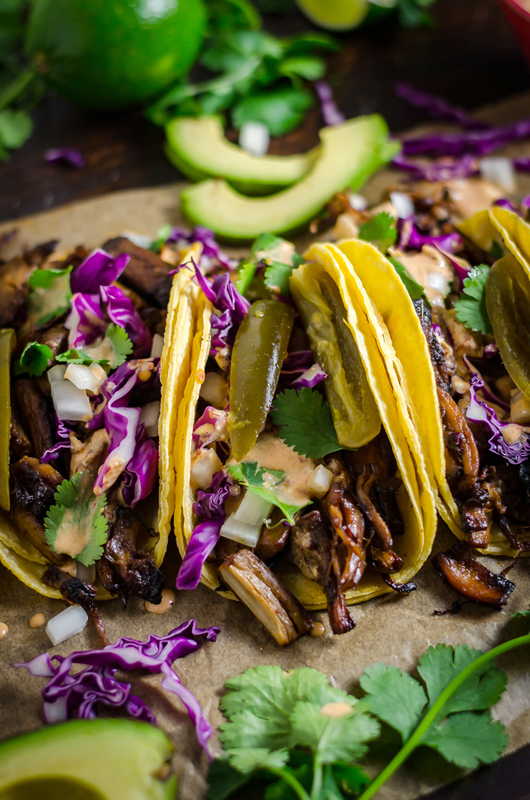 Since cooking the mushrooms in liquid is the best way to get them to have a great consistency, I flavor my liquid with orange juice, lime juice, cumin, bay leaf, garlic, and most importantly, LA MORENA® chipotle peppers in adobo sauce. 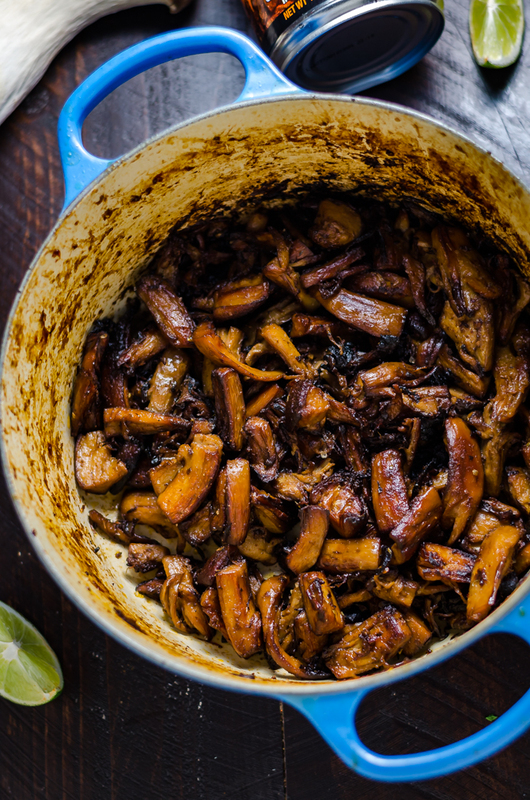 They are my holy grail ingredient (as you can probably tell from the 12 billion chipotle recipes I have on this blog), and they make these mushrooms smoky, slightly spicy, and intensely tasty. You’ll be able to find LA MORENA® chipotle peppers in the international aisle at Walmart– usually they’ll be near the salsas, as you can see in the picture above. 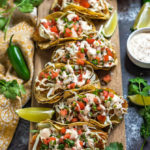 To learn more about LA MORENA® products, what to make with them, and where to find them, check out their site. The greatest thing about cooking these mushrooms in liquid is that I just keep cooking until the liquid mostly evaporates and thickens into a sauce that clings to the mushrooms– no extra work required. Then, I drizzle them with just a little oil and let them blacken a bit to get super crisp and flavorful around the edges. 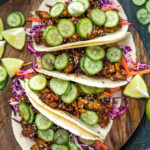 They wind up having all of the crunch and flavor or pork carnitas, with some added earthiness (and of course they’re meatless, Lent-friendly, and less expensive). 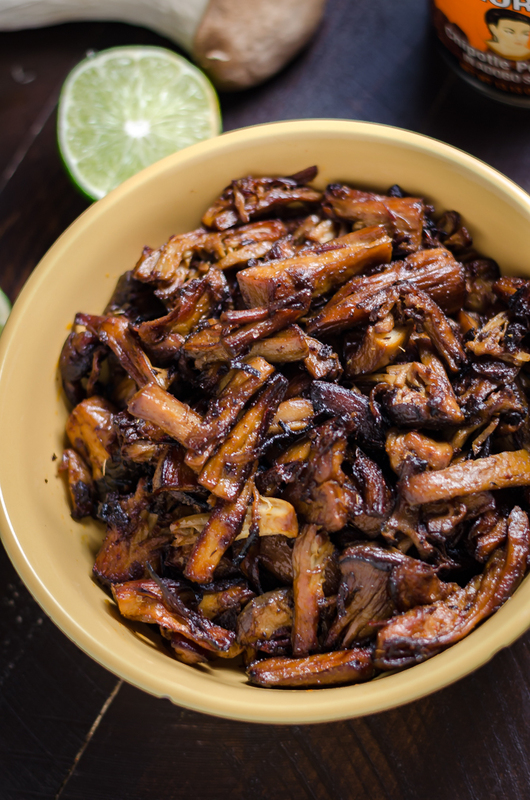 I knew that the mushroom carnitas would be good, but I never imagined how addictive little mushroom morsels could be, even before piling them up into tortillas. I found myself picking at them non-stop, double and triple and quadruple checking that they actually were that good. This is the type of vegetarian food that I could live off of. James even tried and surprisingly enjoyed these, and mushrooms are the only thing other than seafood that I haven’t gotten him to budge much on in the pickiness department. “They’re still mushroom-y but they’re actually pretty good,” he said. I’ll take it. Like I said, they’re awesome without being tucked into tacos, but why rob yourself of the opportunity? 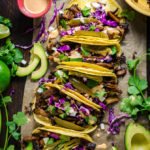 Go all out with these mushroom carnitas by wrapping them in corn tortillas, topping them with crunchy cabbage and creamy avocado, sprinkling them with sharp raw onion and fresh cilantro, drizzling them with chipotle mayo (or vegan chipotle mayo, if that’s more your style), and lastly, topping them off with LA MORENA® Sliced Jalapenos. Hey, if you’re going to do it, you might as well do it up. At least that’s what I told myself as I downed 3 of these jam-packed Mushroom Carnitas Tacos. In a large, heavy bottomed dutch oven or pot, combine all of the mushroom carnitas ingredients, and add water to mostly cover the mushrooms. Bring to a boil over medium-high heat, then reduce to a gentle boil until the mushrooms have softened and most of the liquid has been absorbed, about 30 minutes, stirring occasionally. Test to see if the mushrooms can be pulled apart easily with two forks. If not, add additional water and continue to cook again until the mushrooms can be pulled and the liquid has reduced. Pull the mushrooms and add them back to the pot. Drizzle with additional oil, as needed, and increase the heat to gently fry the edges of the mushrooms. If you’re having trouble getting your mushrooms to crisp, transfer them to a rimmed baking sheet and broil them until beginning to blacken. Before serving, mix the mayo with adobo sauce, to taste. 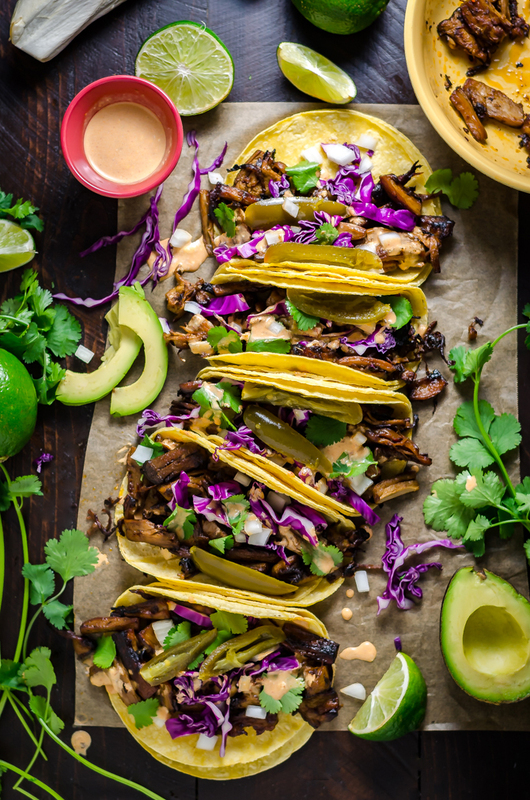 Serve the mushroom carnitas inside of tortillas, with all of the toppings and a drizzle of chipotle mayo. This looks absolutely delicious! But where do I find king oyster mushrooms? I have never seen them at my store. If you are subbing say Portabello mushrooms do you still cook them whole, and may slice them after since they won’t pull apart the same way? Or do you slice them first and then cook them? I’d probably lean towards cooking them whole and then cutting them, but either way should work fine. Could you clarify what you mean by 1 LA MORENA® Chipotle Pepper in Adobo, chopped, plus 1 teaspoon adobo from the can? 1 pepper from a can of chipotle peppers in adobo (which you can find in the International aisle), as well as some of the sauce the peppers are packed in. I hope that helps! Oh boy! I used the whole can of chipotle and it was spicy! I didn’t read the ingredients correctly. Does the type or brand or orange juice matter? Mine ended up with a lot of moisture absorbed, so when I tried to crisp them on the stove top after cooking them in a pot, there was too much moisture to make them crispy; they stayed soggy. Advice? I’ve been cooking the mushrooms for over an hour and they’re still not tender with a lot of liquid in the pot. What am I doing wrong? 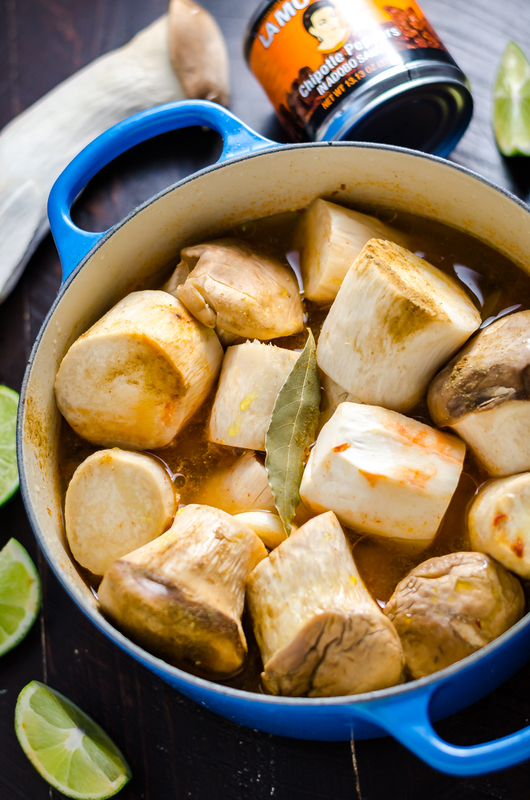 Should the pot be covered or uncovered while simmering? The pot should be uncovered. It sounds like perhaps the heat is too low. Has it been boiling for an hour and still the mushrooms aren’t tender?